Scottish Retail Sales Monitor May 2014: Worst Ever? Every month the Scottish Retail Consortium together with KPMG publish the Scottish Retail Sales Monitor. It is always an informative read, and generally attracts quite a lot of press and other attention, being one of the few up-to-date series on Scottish retail published. 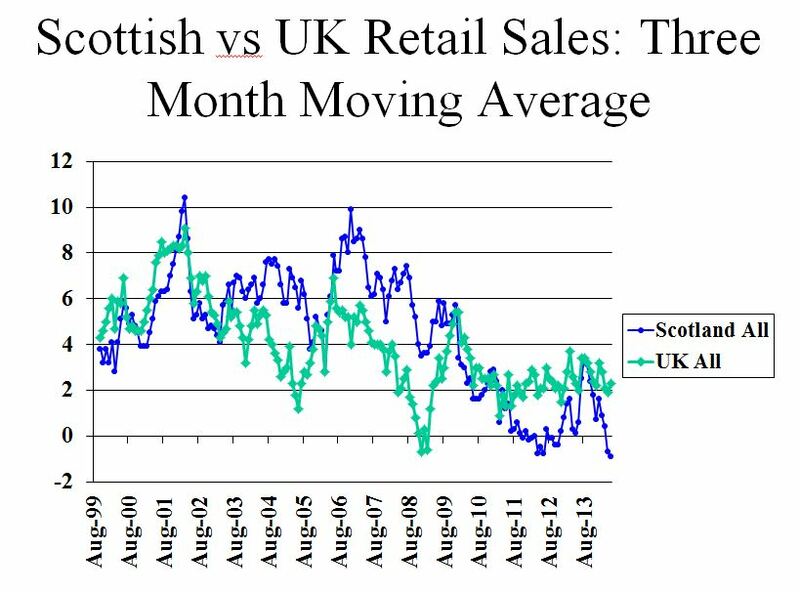 As a snapshot of Scottish retail sales it is valuable and interesting, though as I have noted here before not without its questions. Every month for the last 15 years I have scanned the headlines from the press release and had a quick look at the tabular data to check whether my read of the data matches the headlines and the comments. A few days, or if I’m being lazy, a few weeks later I put the data into a variety of spreadsheets and print out some graphs. I must confess to not getting too excited about single month figures. The reasons should be – though sometimes people surprise me – quite obvious. This year and the timing of Easter compared to 2013 is a good example of how the series gets destabilised year on year by timings or holidays and events, and that’s going nowhere near the weather. So I tend to look at the 3 month moving averages. I also tend to focus on total sales rather than like for like on the basis I want to see the overall picture at a sector level. In May 2014 total Scottish sales decreased by 1.6% compared with May 2013, when they had increased by 0.8%. Like for like sales decreased by 2.7% on last May, when they had decreased by 0.5%. Taking account of shop price deflation, May total sales were down 0.2% in real terms. Total Food sales were 2.0% down on May 2013, when they had increased 1.5%. Over the last 3 months, total Food sales declined by 1.6%, in contrast with a 12-month average growth of 1.3%. Total Non-Food sales decreased by 1.4% on a year earlier when they had increased 0.2%. Adjusted for the estimated effect of online sales in Scotland, total Non-Food sales would have increased by 0.8%. Over the last three months, adjusted Non-Food sales increased 1.1% against 2.8% over the last twelve months. Adjusted for deflation measured by the BRC-Nielsen Shop Price Index, Total Scottish sales declined 0.2% in May, the lowest performance since Christmas, excluding Easter distortions. Not the most pleasant reading. The overall pattern for Scotland is thus still quite depressed, with a weaker performance than the UK. It should also be noted that despite some comments about online sales, it is still a little unclear how they are treated in the Scottish and the UK recorded data, making the comparisons I want to make between Scotland and the UK (or even preferably the Rest of the UK) a little uncertain in my view. But my biggest surprise came when I put the data into the spreadsheets and printed off my three monthly total sales UK vs Scotland graph. As far as I can see, the figure for Scotland at a decline of -0.9% is the largest this series has ever recorded since its inception in 1999. This beats even the descent into the credit crunch (though not the pace of decline thankfully), and is the worst ahead of the twins of April and June 2012 when -0.8% was recorded. Now I find this a little worrying and certainly every bit as much a headline as those produced by the media. We might debate about using total sales versus like for like, the increasing role of the internet, or the role of deflation etc. But, on the face of it, Scottish total sales remain a real problem and the end of the recession and the gloom are still postponed. Let’s hope next month’s figures, given the recent weather, are a much happier read, though one swallow and all that…..
As a final thought, just as I went to post this entry, STV and the Scotsman are covering a story from a new report by Colliers International. I have not seen the report, but the press coverage focuses on the “fragility” of Scotland’s retail sector. I certainly second that. This entry was posted in BRC, Internet, Longitudinal Data, Scottish Retail Sales and tagged Consumer Spending, Retail Economy, Scotland's retail sales, scottish retail consortium. Bookmark the permalink.